silence diary > How to reduce smartphone irritation in lobbies, restaurants, and lounges? 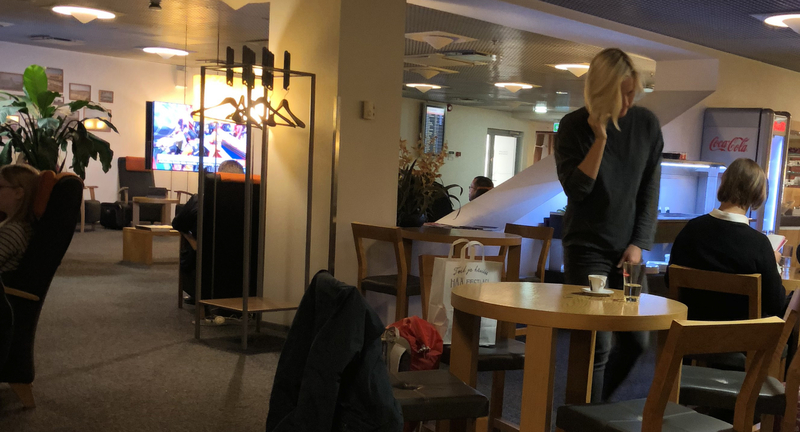 Just before leaving Estonia, and getting back to Belgium, I took this picture in the airport lounge. I remember that I was doing some creative work at that time. I was sitting on a bar stool, at a high table, overlooking the tarmac of the Lennart Meri Tallinn Airport. I had some neighbors on both sides working on their pc and phones as well. And I remember that, when the phone of one of the neighbors rang, she excused herself and went to a different more secluded place to answer the phone. Which was n ot the case with the lady on this picture. She answered the phone, stood up from her seat, walked around the lounge, and got into a fierce debate over the phone. She was speaking very loud. The only reason why I could not understand what she was saying, was that I did not speak her language – and I am sure it was not Estonian, since I am already beginning to recognize some characteristics in the Estonian language. So she went on for a while, totally ignoring the angry faces around her. I sometimes have the guts to go see such a person and politely ask to dim the voice, but in this case, I did have to cross a certain distance, being tired of a long working day, noticing all the people around to be irritated in silence. You cannot always be the one single person that takes the initiative, can you? Actually, something similar happened some hours before, in the morning at breakfast. Four friends were having their breakfast in the beautiful top-quality Telegraaf hotel in the old town of Tallinn. All of a sudden, one of them wanted to show his friends a movie on his phone. Loud. Full volume. So that all the other guests tried to find out where the irritating noise came from. And the guy with the phone did not seem to be embarrassed at all about it. Although he must have seen the two people besides him not really liking the scene. And again I could have stepped towards the guy and politely ask him to care a little bit more about the others in the room. But hey, I was sitting three tables to the left, and I was about to leave for my next meeting, when this happened. What at first surprised me is that not even the waiters seemed to take any initiative, although one might expect that from a top-class hotel like this one. But then again, I understand that having to change the attitude of a guest is not what a regular waiter will be focused on, when they are told to be top-class service providers for each of the guests, ensuring the coffee and tea cups do never get empty. The question then is, how to avoid this? Because most guests do not like a few guests to ruin their day when they pay a lot of money for a great hotel experience – and the hotel is not making money on some rare bullies, or do they? I think it could start with a gentle note on the menu. Something like “may we ask you to respect the other guest’s morning experience by switching your phones to silent mode and keeping your voice low to the normal conversation levels”. It might help other guests to gently point out to the note. In the bathroom, there is this little note about the planet and the use of towels. So why not make it visible to all guests that a certain behavior is not appropriate? Based on such a gentle note, one can then instruct the staff to keep an eye on the noise levels in the breakfast area. Now that I write this, I remember that I was sitting next to a young couple with a baby, just the day before. I remember the baby getting a bit nervous, but the parents immediately went “hush, there are other people in this room that want to enjoy breakfast”.